A coalition of breast cancer survivors and their supporters came to San Francisco today to help launch the sales of pink ribbon California license plates that will help fund breast cancer screening for underserved Californians. The organizers of the California Pink Ribbon License Plate campaign must acquire 7,500 pre-orders of the pink license plates before August 2016, which is when the California Department of Motor Vehicles issues license plates, according to campaign spokesman Steve Maviglio. 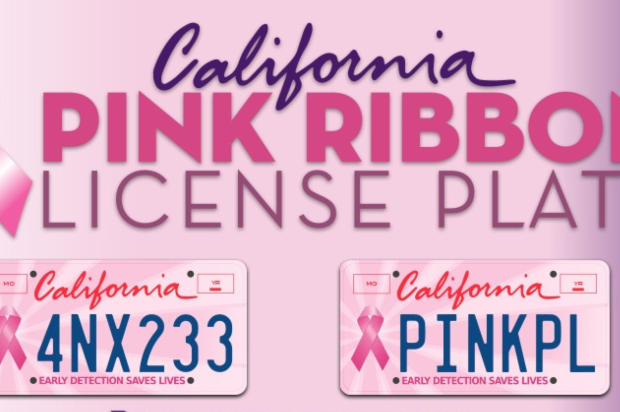 According to organizers, the pink ribbon license plates were created to promote a message of awareness regarding the importance early detection while helping fund the state’s Every Woman Counts program, which is administered by the California Department of Health Care Services. The pink breast cancer license plates graduated from idea to reality in September 2014 when Gov. Jerry Brown signed Assembly Bill 49, the bill permitting the creation of the license plates. The legislation was authored in 2013 by then-state Assemblywoman Joan Buchanan, D-Alamo, and was unanimously approved by the Legislature. Significant portions of the sales will help fund the Every Woman Counts program, which provides low-cost and no-cost breast cancer screenings, exams, mammograms and other early detection services to California women in hundreds of clinics and hospitals throughout the state, Maviglio said. The license plates cost $50 for a standard pink license plate and $98 for a personalized plate. Pre-orders for the breast cancer license plates can be completed at PinkPlate.org. In addition, organizers plan to be present at the Susan G. Komen Race for the Cure in San Francisco on Sept. 27.